Today I am going to exploit more about online marketing of Woocommerce stores and under and prepared an extensive list of best WooCommerce plugins 2019. We’re living in an age when Artificial Intelligence (AI) and Machine Learning are emerging as underlying advanced techniques that replace repetitive manual jobs with smart automation. In eCommerce, marketing automation nowadays is definitely where brands pick up. Beeketing for WooCommerce plugin was built from that idea and is now a must-have marketing automation tool to supercharge sales growth for WooCommerce businesses. ….and many more features are added regularly. What is worth noticing about Beeketing is their superior dedicated service that delivers happiness and success to their customers. Gaining ~300+ reviews from trusting customers in less than 1 year, Beeketing proves to be a customer-centric product that grows from their customers’ success. With the release of Woocommerce 3.0, admin orders page is being optimized for performance and missing some important columns. 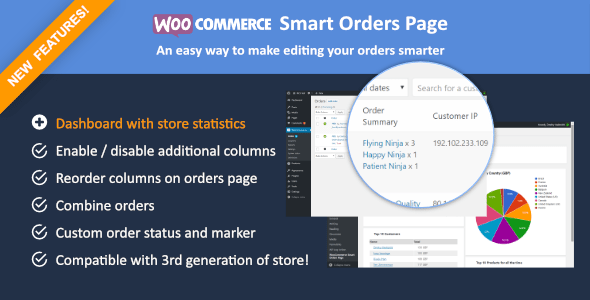 Woocommerce smart orders page adds additional columns to orders page so admin and sales staff can manage orders and their stores easily. 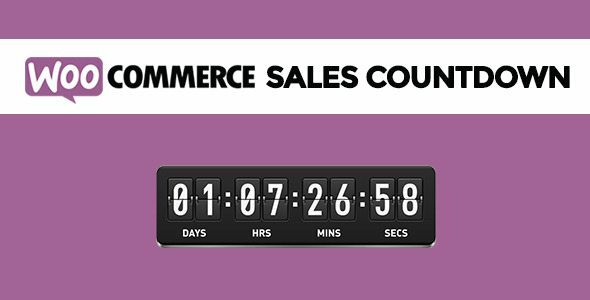 WooCommerce Sales Countdown is a wonderful WordPress marketing plugin to promote your sale campaigns in WooCommerce & eCommerce WordPress Theme and to boost your store’s sales. A countdown box with the product on sale is shown to tell your customers how much time is remaining to purchase the product with discount. Counting time till the up-coming sale period also can be made with the WooCommerce Sales Countdown. I put this wonderful Woocommerce Sales Countdown as one of the best WooCommerce plugins for marketing because it is lightweight core and optimized for the best performance. With options right inside the WooCommerce setting area, you can easily configure this WordPress marketing plugin. The WooCommerce Sales Countdown is fully compatible with any WordPress WooCommerce theme. It is a big failure if I do not mention about top-notch quality of customer support which ThimPress is offering to their customers. All issues and inquiries are quickly handled in a friendly manner. 16$, 433 sales, 120 comments, 4.19/16 average buyer rating are clear proof to show this WordPress marketing plugin is one of the best WooCommerce plugins for marketing. And now, let’s see how customers are talking about WooCommerce Sales Countdown. Woocommerce PDF Vouchers is a powerful WordPress marketing plugin because you can generate unlimited unique codes without the need to provide them, import codes via CSV, restrict codes to be used only one time, use codes unlimited times, export a list of all purchased voucher codes as PDF and CSV as well… more than that you can create unlimited voucher templates with Drag & Drop interface for local businesses / local stores or even online stores, assign vendor users to the voucher. Especially, with a clean & user-friendly admin UI, you can easily create and manage all vouchers. Currently, WooCommerce PDF Vouchers has 552 sales, 165 comments, 4.89/28 average buyer rating. It is now a trending of searching on CodeCanyon and is considered as one of the best WooCommerce plugins for marketing implemented on WordPress WooCommerce theme. Galaxy Funder also is put in this list of best WooCommerce plugins for marketing. It is built on top of WooCommerce with complete, powerful and rich features: front end campaign submission for members; back-end campaign creation for moderators; mailing options for campaign submission, approval, rejection, deletion and completion, contributor table as per admin settings can be shown in each campaign; responsive, searchable, sortable tables and page size adjustable; contribution by PayPal; PayPal adaptive split payment gateway so on and so on. This WordPress marketing plugin is used to run your own crowdfunding site or add the campaigns for crowdfunding on top of your existing WooCommerce shop. Each campaign creation is similar to creating a WooCommerce simple product. In the simple product page, you have the option to Enable Galaxy Funder which when checked ON will turn the simple product into a crowdfunding campaign. There are two types of crowdfunding campaigns in Galaxy Funder: fundraising by crowdFunding – a regular type of running a crowdfunding campaign for raising funds; product purchase by crowdfunding – to create a crowdfunding campaign for buyers who want to buy some products but they do not have enough money. The buyer can then promote the campaign with his/her friends for funding. Once the target amount is reached then the products are automatically added to the campaign creator’s My Account purchases. 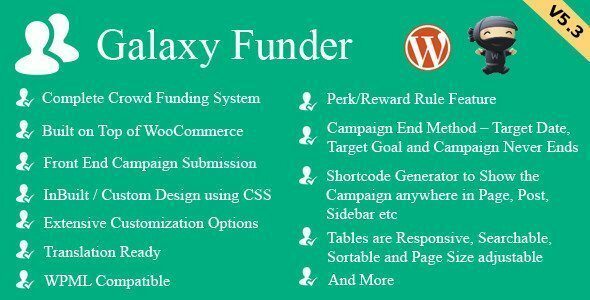 Galaxy Funder is becoming a successful WordPress marketing plugin with 327 sales, 197 comments, 4.12/24 average buyer rating. 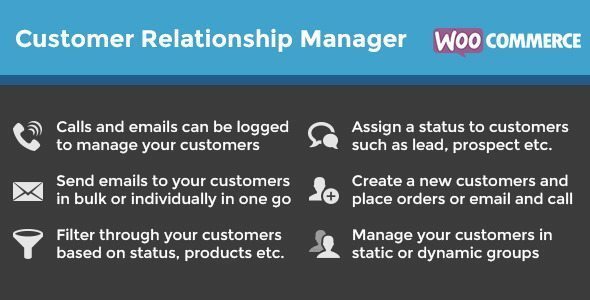 The sales amount of WooCommerce Customer Relationships Manager is a dream for all WordPress developers. 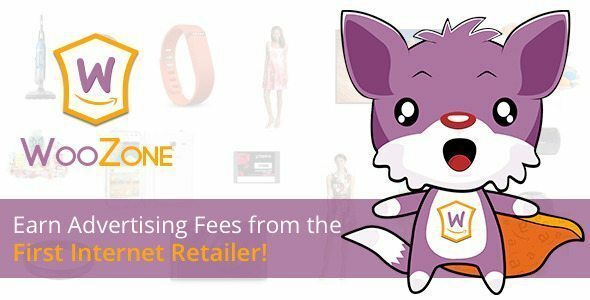 With 1616 sales, 611 comments, 4.59/ 56 average buyer rating, this plugin is worthy for you to pay and think as one of the best WooCommerce plugins for marketing. WooWaitlist is a wise marketing method to keep your potential customers as regular and permanent ones. This WordPress marketing plugin is built to send email alerts to subscribers when the product is back in stock. Once visitors notice an item is out of stock, they can register to receive notification when that item is arriving. It really saves your time and your customers’ time. Client waitlist can be shown on their profile page using a shortcode. You also can export the waitlist subscription to a CSV file and use it for your marketing plan or strategy. When visitors and users do not want to receive at all, they can easily unsubscribe from the list, directly from emails received or using the shortcode. 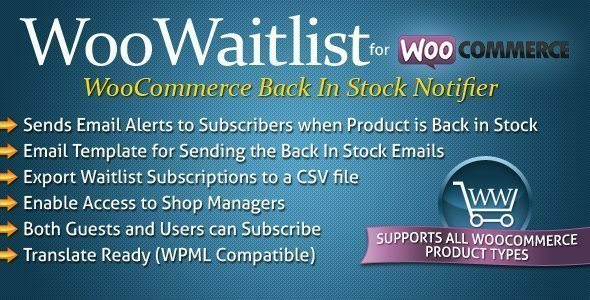 WooWaitlist is one of best WooCommerce plugins for marketing because it provides a wide range of outstanding features such as Plug and Play; tabbed and Easy to Use Backend Interface; supports all WooCommerce Product Types; WooWaitlist data and settings can be saved in any case of removing the plugin from website; enable or disable access to the plugin for Shop Managers; email template for sending the Subscription and Back in Stock Notifications… WooWaitlist is having 472 sales, 120 comments, highest average buyer rating of 4.67/33. WooCommerce Amazon Affiliates is a WordPress marketing plugin to set up an affiliate site and import products from Amazon. You advertise Amazon products on your WooCommerce website and then earn advertising fees from qualifying purchases. The 90 days cookie feature can let you receive advertising fees from all products which your visitors buy, visit, not just products you advertise. When products are no longer available on Amazon, it will automatically remove from your site. We called WooCommerce Amazon Affiliates as best of the best WooCommerce plugins for marketing because of its outstanding features: excellent one-page optimization, great SEO content, ultra-fast import system, custom AA – team framework, module manager, very easy to use, advanced search & bulk import module, CSV module, ASIN, on-site cart… WooCommerce Amazon Affiliates is having a huge sale amount with 6600 sales, more than 2000 comments and 4.50 average buyer rating in CodeCanyon. Why is marketing a need of online business? Targeting customers of the online business are in national scale or even international scale because currently there are 7 billion of internet users all over the world. How do you make people aware of your business? The most effective way is marketing cause it can get potential customers known about your product and your brand name, increase sale result, boost company reputation and improve healthy competition for your company. Online marketing is an action, system, a set of powerful tools or method to promote products or services through internet channel. From this information, herewith I would like to give you a list of best WooCommerce plugins for online marketing which is under the trending searching on CodeCanyon. The criteria to evaluate them as best WooCommerce plugins for online marketing 2015 are based on their features, sales amount, good rating and comments for them. WooWaitlist – a Back In Stock Notifier and WooCommerce Amazon Affiliates – to set up an affiliate site and import products from Amazon. I am so sure that these WordPress plugins can be all your best WooCommerce Plugins for marketing, especially for WordPress eCommerce Themes. These plugins are great for enhancing website’s functionality. Although not entirely geared towards “marketing” per se, our customers are finding that marketing “Credit Bundles” is a great way to attract interest and gain new customers, as you are providing them incentive to return to your site in order to make sure unused credits aren’t wasted. Just found your site today and excited to keep tabs on your latest posts!